ISLAMABAD — A suicide bomb blast in Afghanistan’s eastern Kunar province Friday killed at least two people, including a senior provincial member of parliament. Afghan officials identified the slain politician as Shah Wali Hemat, saying he was walking to join a nearby funeral procession in the district of Wattapoar when the bomber intercepted him and detonated his vest. The blast also killed a local religious scholar accompanying Hemat and wounded several other people, said witnesses and officials. 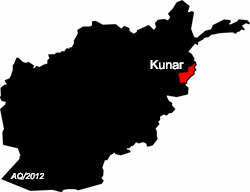 Kunar, which borders Pakistan, is one of several Afghan provinces where both Taliban insurgents and Islamic State militants actively operate.